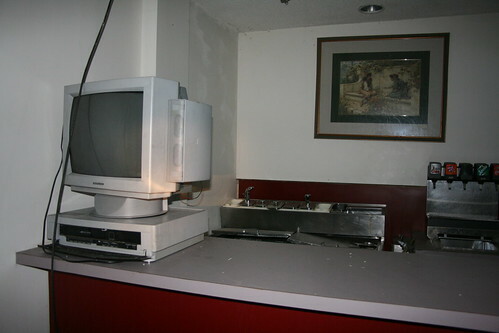 A rotating TV that looks a lot like a CRT computer monitor sits atop a VCR in the snack bar just behind the main lobby (also behind the upper lobby bar). A soda fountain and other stainless steel serving systems sit unused awaiting new customers. At first I mistook this for a cash register, but it is indeed just a VCR.